To the surprise of many investors, the precious metals have rallied while the broader markets continue to sell-off. Currently, both gold and silver are solidly in the green while the major indexes were all the red following a huge sell-off yesterday. 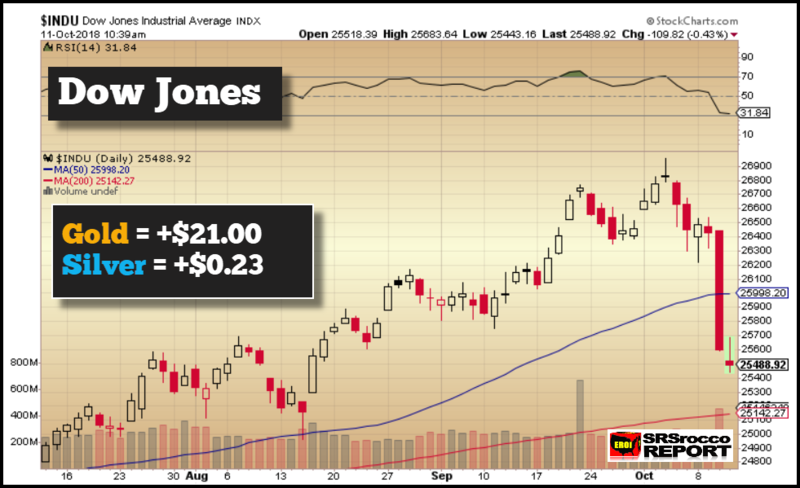 The Dow Jones Index has lost nearly 1,000 points in the past two days while the gold price is up nearly $25. 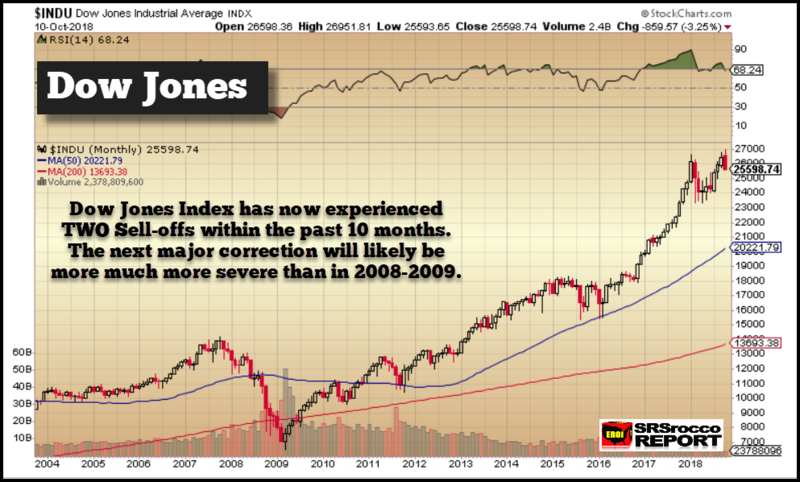 In January, the Dow Jones Index fell by more 3,000 points, and the current correction is only one-half of that amount. So, I expect to see a continued correction over the next month. Because October is the worst month for market Crashes, this could be one hell of a blow for not only the economy but also, for investor confidence. 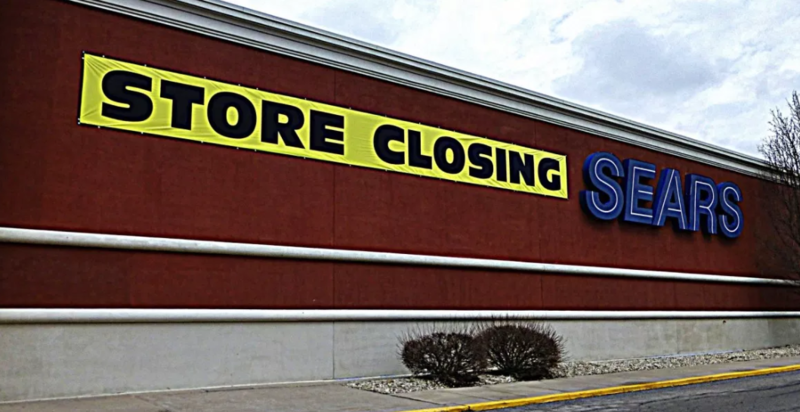 According to the WSJ, a group of Sears’ biggest lenders, including Bank of America Corp., Wells Fargo & Co. and Citigroup Inc., are pushing for the company to liquidate its assets under a chapter 7 bankruptcy filing, as opposed to reorganizing the business under chapter 11, this person said. Interestingly, Sear’s major lending institutions (Blank of American, Wells Far-gone & CitiCorpse) are pushing for a complete bankruptcy liquidation rather than a reorganization. I gather they believe the “brick and mortar” retail industry is likely heading for the dustbin as the Amazon’s of the world takeover. 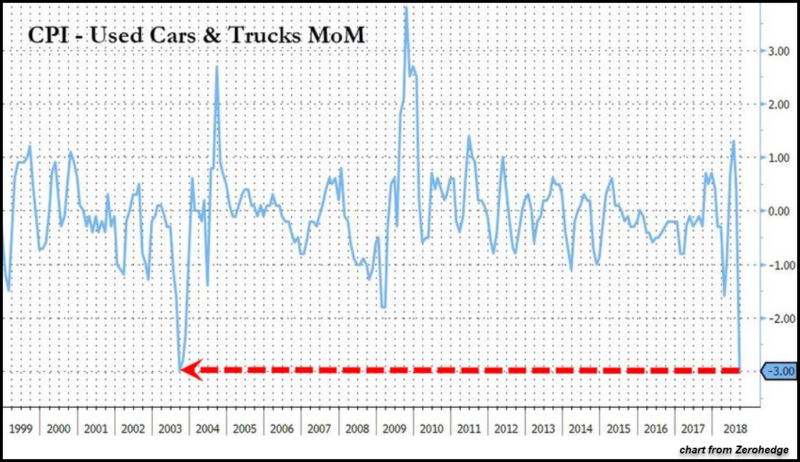 I can assure you that “Amazon Economy” won’t last for much longer especially when the U.S. economy and shale oil industry collapse. Now, I am not saying that gold and silver can’t spike lower, but according to market sentiment and the COT Report, the precious metals are closer to a LOW while the broader markets are still trader near their HIGHS… even with the last two-day correction. Once the major stock indexes head into a sustained bear market, you can count on investors “ROTATING” out of stocks and real estate and into the precious metals and the gold and silver miners. I expect the precious metals and miners to be one of the HOTTEST in the entire market during this time. 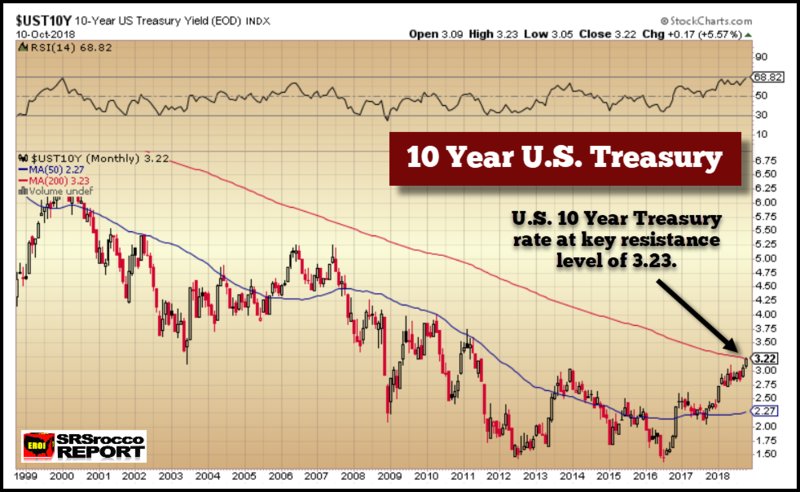 As we can see, the 10-Year U.S. Treasury rate has hit up against its 200 Month Moving Average (MMA, in RED). Typically, it will bounce off this and head lower, but if it doesn’t, then it could spike even higher. We must remember, higher interest rates aren’t good for the U.S. Government’s ability to service its debt. The U.S. Treasury had to fork out an additional $65 billion of interest in 2018 versus 2017. 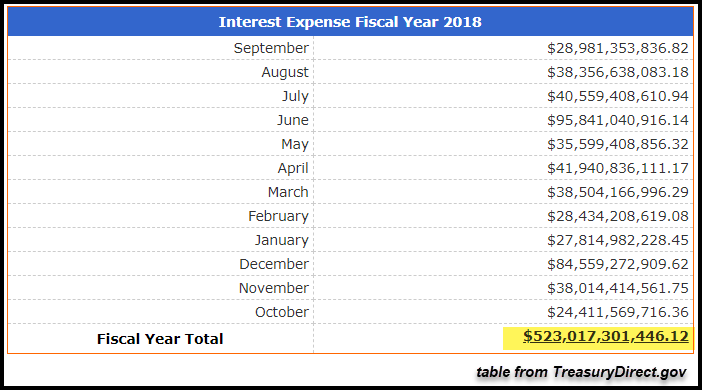 The annual interest expense jumped from $458 billion in 2017 to $523 billion in 2018. That’s nearly a 15% interest expense increase in just one year. If the average interest rate for U.S. debt only increased to 3%, up from the 2.3% currently, its interest expense would balloon to $648 billion, based on $21.6 trillion of debt. So, as we can see, the fundamentals for the U.S. economy and market are in serious trouble. I imagine President Trump, the Fed Chairman, and U.S. Treasury Secretary will do all in their power to keep the markets from imploding, but eventually, the fundamentals kick in. And when they do… they will do so in a BIG WAY. Lastly, while the gold and silver miners are still wholly out-of-favor with most investors, don’t be surprised to see serious gains over the next several years as the broader markets head into the toilet. I know this sounds counter-intuitive, but there just won’t be much for investors to protect wealth during the next major downturn. While First Majestic reached a high of $25 in 2011, I wouldn’t be surprised to see it at least five times higher during the next bull market. 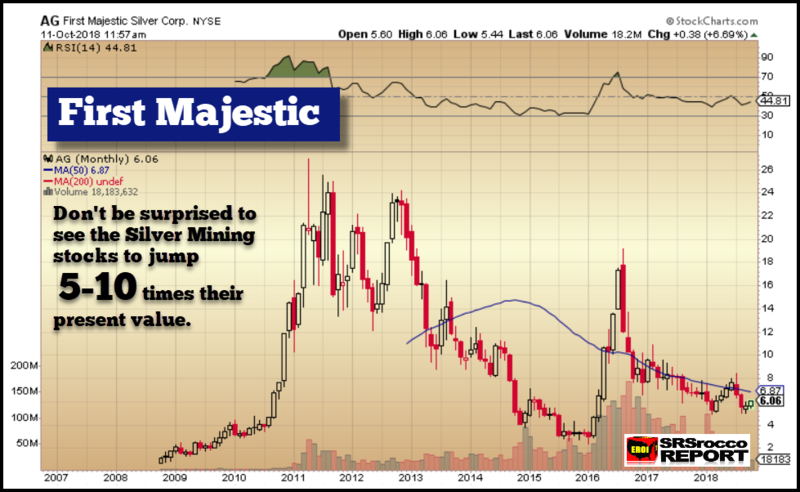 IMPORTANT NOTE: I just picked First Majestic as an example of the primary silver miners market. So, do not trade or make any investment decision based on this information. Do you own due diligence before making and investment decisions. However, common sense tells us that the past ten years of propping up the markets with more paper money and debt will not bode well for most stocks, bonds, and real estate. Gold and silver have been stores of wealth for thousands of years even though the typical investor has been hoodwinked by Wall Street and the Central Bankers.